Share the post "Old Stone Church"
I think if there was no wind today it would be nearly unbearable outside. The humidity is getting up there again where we may be looking at rain soon. I’ll be glad if it does come just to get the temperatures lower along with the humidity. By having several showings of homes this afternoon with air conditioning, I felt I received a least a little respite from the heat. I was thinking of a home over the weekend which I’d looked at for some sellers several months ago, and as chance would have it, they called today and want to meet with me tomorrow. It’s funny how so many people think I’d forgotten their homes when going into more detail than necessary when calling. That particular home I remembered well because of its exceptionally large kitchen dining area. If you really think about it, when there’s something just a little bit different about a home, it is more acutely remembered. Most don’t want to admit it, but we use that same way of remembering people we’ve met. They can have more unique facial features, their apparel can be distinctive, their height or breadth can be memorable, and the list goes on. Even the way in which they part their hair can be uniquely memorable. There was a businessman who worked Downtown who’s now retired and moved way, but I’ll never every forget him due to the way in which he parted his hair—right down the middle! Every time I’d see him on the street the first thing I would notice was that down the middle parting of his hair. Getting back to homes, most don’t realize that nearly every home has a distinct smell and that smell is well remembered if it’s strong enough. Keep in mind, in one of the more primitive areas of our brain is where a smell is permanently remembered, and very acutely I might add. We all know what a dead mouse smells like as well as rotten eggs, moldy bread, rancid lard, and the list goes on of those nasty smells, but just remember the roses, lilacs, lily-of-the-valley, irises, and all the other flowers that we’ve smelled and remembered. Every narcissist wants to be acknowledged as being special, but not to the extent they’re expecting. Yes, we are all very special in our own way and there’s at least one ability or feature we possess that lifts us above the milieu. In realizing yesterday that my morning after the fourth didn’t have any pressing duties, I decided I’d take an un-scheduled long trip out of town to get another errand run that’s been on my back burner of things to do for over a month. It took me longer to get there due to several detours posted on two different highways causing me to take an even longer route. Once at my final destination, I was relieved to find I didn’t have to stay as long as I thought once the errand was accomplished. 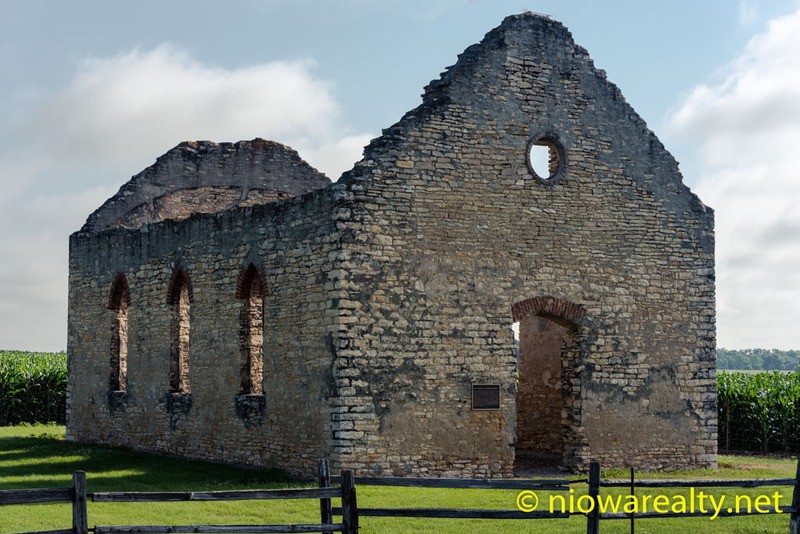 While driving back on a road I’d have to think about which, I noticed a small white and black sign with an arrow pointing in another direction that stated, “Old Stone Church”. Curious me had to turn around and have a look for myself and indeed worthy of the above photo. The distance to the old stone church was farther than expected but worth it. I walked around the stone shell of a Lutheran church built in 1872 and was saddened by its vacancy and structural neglect. After walking thru its very old cemetery and reading the birth and death dates, I was reminded how hard life must have been when the Old Stone Church was alive and well.